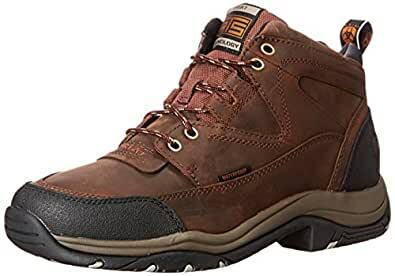 They're comfortable to hike in, warm, fit well and and had become my go to shoes to wear with jeans. and in addition to feeling comfortable there are very nice looking boot. Terrain WaterproofEndurance riding means covering a lot of ground, a variety of terrain, and shifting weather. These are built to take it. ATSÂ technology stabilizes and secures the foot, reducing fatigue. Waterproof Proâ„ keeps the elements out, and flexible Duratreadâ„ soles endure. 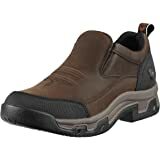 I've worked construction all my life and wish I'd found these boots in my 20's instead of my late 40's. I'm 61 now and still wearing them. One of the problems with a proper work boot is the soles. If they grip enough to keep you safe they also pick up lots of crap and mud that inevitably gets tracked inside, whether on the job, your truck or home. 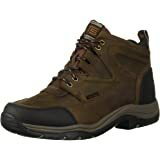 These boots have superior grip without the lug mess of all the others I've had. They wipe off clean easily on a mat. I'm on my fifth pair now. Spend the extra and get the waterproof ones, they still breathe. Pay attention to that little detail while you're shopping. 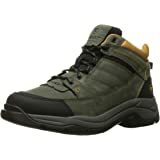 The laces give out before anything else and they are good and tough, this is one long wearing boot. I trashed my ankle when I was stationed overseas so when I first bought these I wasn't sure they would support where I needed. They do. I'd give them six stars if possible. A working man has to have good equipment. Sizes run true. I ordered a pair anticipating some rainy weather. They arrived, they fit well, and were comfortable. They felt broken in right out of the box, so I was pretty happy with them on the first wearing. That, however, was not a rainy day. The next day, there was a mild to moderate downpour, and I wore the boots to work. 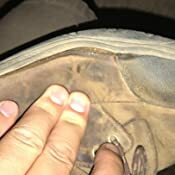 After a short time of city walking in light rain, the sole of the right boot separated from the body of the shoe and my right foot was soaked. 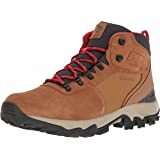 I was discouraged, but liked the design and comfort of the boots overall, so I tried a replacement pair rather than a refund. I shouldn’t have wasted the time and effort. I received a new pair, which fit well and were comfortable. Until it rained. This time, the boots stayed together, and both my feet got wet. Again, it was just a mild to moderate rain and normal walking in the city. I didn’t slosh around in puddles, it was just rain, and my feet were soaked. This time, I sent them back. I bought a pair of the H2O model for my wife. After seeing how well they fit right out of the box, I bought a pair for myself. I called Ariat Customer Service for advice. I wanted to know if they ran large or small. Ariat was very helpful. My boots fit perfectly right out of the box and I had no breaking in period. All that and waterproof as well. After several months, they’re as comfortable as ever. 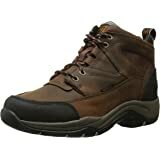 Excellent company with excellent customer service making excellent boots. Very happy with my purchase. Boots fit as expected. I have wide feet and the EE which is not usually offered was perfect. 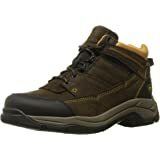 They are very well made and look nice enough hang out and go places with, not just for hiking or shoveling snow which was what they were intended for. Haven't tested their water proof quality yet so will follow up on that with the next snow which might be in a few days. Wore them for about 6 hours the first day and they were comfortable until the last 30 minutes or so. As they are leather they will conform to my feet for longer wear. . Looked around quite a bit before settling on these boots. 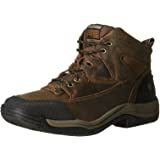 The price point was where I wanted to be for a pair of hiking boots, but I was concerned about whether or not the quality would be sufficient. Now I wear them all the time and couldn't be happier with them. The only complaint I could make is that the tread isn't as aggressive as I would have liked for actual hiking in the woods. Otherwise, they are perfect for every wear and tear. 1.0 out of 5 starsGood to start, didn't wear well. Initially, I was really pleased by this product. 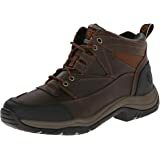 They're comfortable to hike in, warm, fit well and and had become my go to shoes to wear with jeans. HOWEVER after only about 60 days I see where one of the eyelets is starting to separate from the leather upper and will likely rip out altogether in a short period of time. I would have expected better quality more durability in a hiking boot. 4.0 out of 5 starsVery good but should last much longer. These fit perfectly. They keep my feet dry all day long from early morning dew on tall grass and even mud and puddles of water often found around the stable . Especially nice in winter where wet socks make me miserable. I can walk and ride in these comfortable enough. I punish them in harsh conditions and they clean up easily on a daily basis. They do wear out the stitching and bust open on the top below the laces after about 6 months while the rest of the shoe is still in great shape, that spot could be reinforced and they would last much longer . Also they are priced too high for Chinese made shoes but so are most shoes with huge profits and poorer quality. So I only get them when the price is reduced. 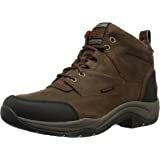 5.0 out of 5 starsA most comfortable boot. Holds up well. These are my favorite barn/riding boots. I wear a man's EE and this is the only place to find my size. The waterproof Terrains really hold up to daily barn wear. Through mud and muck, these boot last. The soles are thick enough that you don't feel every little bit of gravel as you do in the thin soled traditional paddock boots. The tread on the bottem is just right for riding and hiking. These are comfortable all day long. There are matching half chaps too. I have three pair now. On the oldest pair the leather on the side by my little toe has cracked after many years of abuse. My second pair are a women's B width and are just too tight for all day wear. This new pair fits great. So nice to find the wide size!